See Saw piloted the See Tell application with CWS, a reporting system that uses cell phones to collect data. With See Tell, CWS entrepreneurs are encouraged to use cell phones to report issues to the CWS staff about the water businesses. Since February 2013, Community Water Solutions has been partnering with See Saw, a Social Venture based out of Cape Town, South Africa that aims to improve water delivery and sanitation services in Africa through the use of new technology. See Saw reached out to CWS to pilot the See Tell application, a reporting system that uses cell phones to track data from senders for free. The purpose of the pilot was to allow CWS entrepreneurs to report issues with their water treatment centers and to reduce the CWS response time to these issues. In the pilot, CWS field staff also used See Tell to report the communities they visited and the length of time each staff member spent in that community. The pilot was implemented in thirteen CWS communities. The entrepreneurs were given a laminated See Tell sheet with six different numbers to call for six different situations. When they called this number, it would ring a few times and drop the call, so the entrepreneurs were not charged cell phone credit for reporting. On the other end, See Tell would receive the call and log the situation reported. The six situations were: 1. All is well 2. 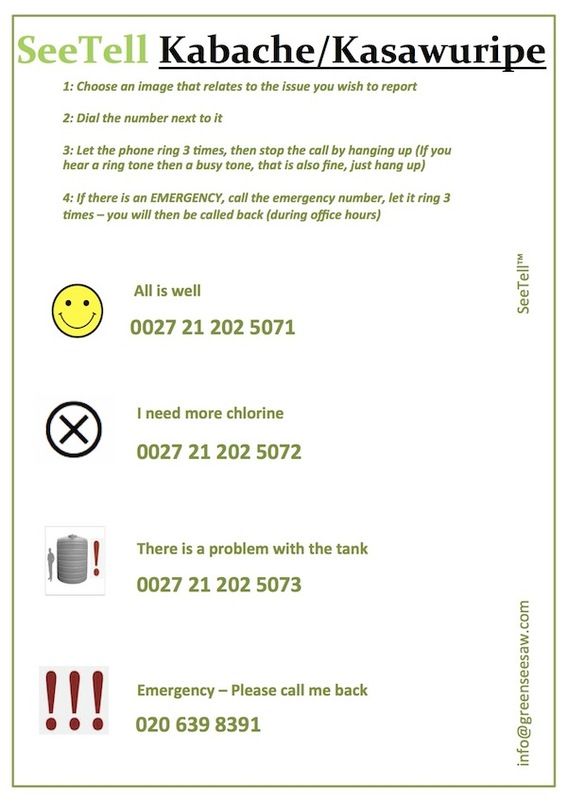 I need more chlorine 3. I need more buckets 4. My tap is broken 5. There is a problem with the tank 6. Emergency! Please call back. The emergency number was actually the CWS staff’s number in charge of that community, so if the entrepreneurs called this number then they would be charged for the call. There was also always the option for the entrepreneurs to “flash” the CWS staff or let the phone ring and drop the call. This way the entrepreneurs would not be charged and CWS staff would have to return the call. See Saw would then send e-mails to CWS every 2-business days (Monday, Wednesday, Friday) to relay all situations that were reported by the entrepreneurs. The emergency number was created so that the CWS would be able to respond more immediately to the situation. An example of a See Tell Report sent to CWS staff by e-mail every 2 business days. See Saw and CWS decided to give the entrepreneurs an incentive of cell phone credit of 2 Ghana cedis, the equivalent of $1 for every month they reported, to entice the entrepreneurs to use the reporting system. MTN is the most popular network used by CWS entrepreneurs because it has the most cell phone coverage in Ghana. The communities are able to make calls with MTN even in very remote locations. 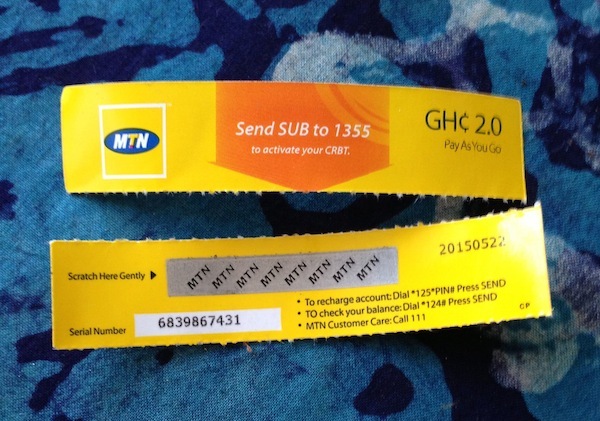 This is an example of the airtime credit distributed to entrepreneurs as an incentive to use the See Tell application. Since the pilot, CWS and See Saw have expanded See Tell to thirty-four communities and by October all fifty-five communities will be using the application. CWS and See Saw have been in conversation throughout the process to make any changes necessary to improve the application. When the entrepreneurs first started using the application, some were not sure if their calls were going through. The “dropped call” was confusing, how could you know See Tell received the report? To fix this problem, CWS staff went back after receiving See Tell reports and informed the entrepreneurs when their call had been received. There were also changes made to the laminated number sheet. CWS recommended that the situations be cut down to four: 1. All is well 2. I need more chlorine 3. There is a problem with the tank 4. Emergency. This would make the options simpler for the entrepreneurs. 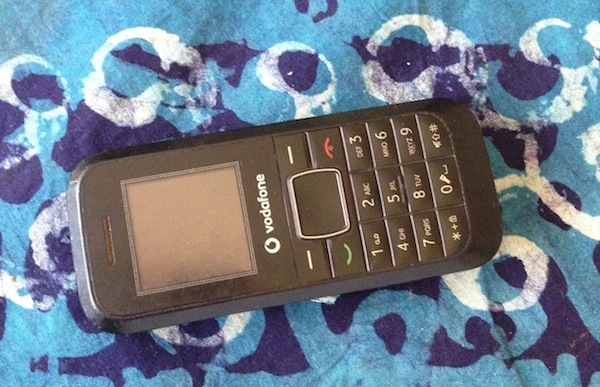 The challenges with the See Tell software in these remote communities are that often times the entrepreneurs do not own cell phones, they have a hard time buying cell phone credit or they do not have access to electricity to charge their cell phones. Fully charged cell phones with credit are crucial to See Tell success. Since the entrepreneurs do not pay for the calls to See Tell, some have been using other peoples’ phones to send in their reports. The See Tell software has overall aided the CWS staff in responding to problems. 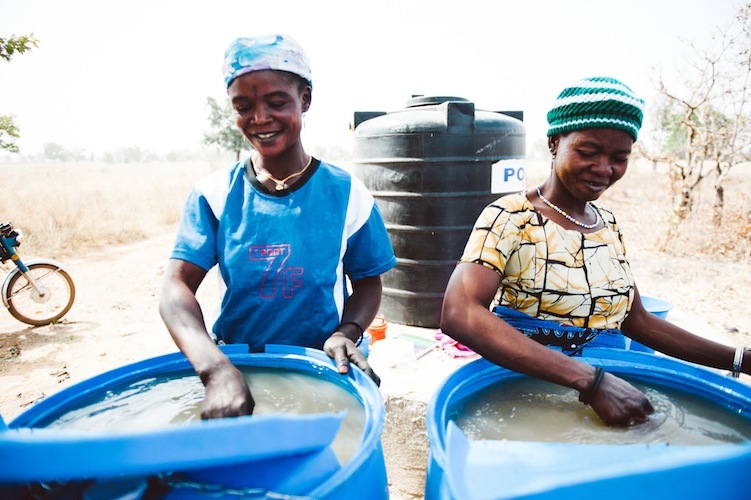 For example, recently in Checko, an independent community that is only visited once a month by CWS staff, Abiba ran out of aquatabs. She communicated through See Tell and the CWS staff was able to immediately follow up and get her the chlorine she needed to keep the center running. The emergency number has been a great way to fuel communication between the CWS staff and the entrepreneurs. As more communities become independent, CWS will need an application like See Tell or a system in place to ensure water businesses are operating without frequent monitoring. The new and improved laminated sheet with 4 situations in which the entrepreneurs can report to CWS Staff. This entry was posted in Monitoring, See Saw, The Saha Team and tagged cell phone, communication, evaluation, Ghana, Monitoring, remote, sustainability, Tamale. Bookmark the permalink.